Makar Sankranti is one of the most important festivals of Hindus celebrated all over India. It marks the beginning of Uttarayana or traveling of Sun towards the north. Sun enters in the Makar Rashi on this auspicious day. So, it is named as Makar Sankranti. "Makar" means the zodiac sign of Capricorn and "Sankranthi" means the act of entrance. Uttarayana is considered as a very auspicious period by the Hindus. 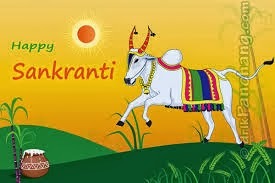 This first day of Uttarayana is celebrated as Makar Sankranti. This festival falls on 14th January of each year as it is based on the solar calendar. Makar Sankranti is celebrated traditionally by taking dips in holy Ganges water or other rivers and offering prayers to Sun and Shiva or Vishnu. It is a belief that all sins get washed out by taking a bath in the holy rivers on this auspicious day and our soul directly reaches heaven after death. On this festive occasion, people wear new clothes, cook Khichdi or Pongal with new rice adding some green gram dal or black gram dal. Some North Indians mix vegetables also in it. They offer it to God and then consume it. All temples will be overcrowded this day with devotees offering special pujas. In Southern India, this festival is celebrated mainly for full four days as Bhogi, Thai Pongal or Sankranthi, Mattu Pongal or Kanuma, and Mukkanuma or kanum Pongal. The first day is celebrated as Bhogi. On this day people wake up early in the morning and take oil bath. They lit a fire in front of their houses dropping all waste clothes and other waste materials into it. It is a kind of shredding the old and beginning a new life. It makes the surroundings also neat and clean. Homes are washed neat and clean and door entrances are decorated by applying turmeric and kumkum at the bottom side of door frames. 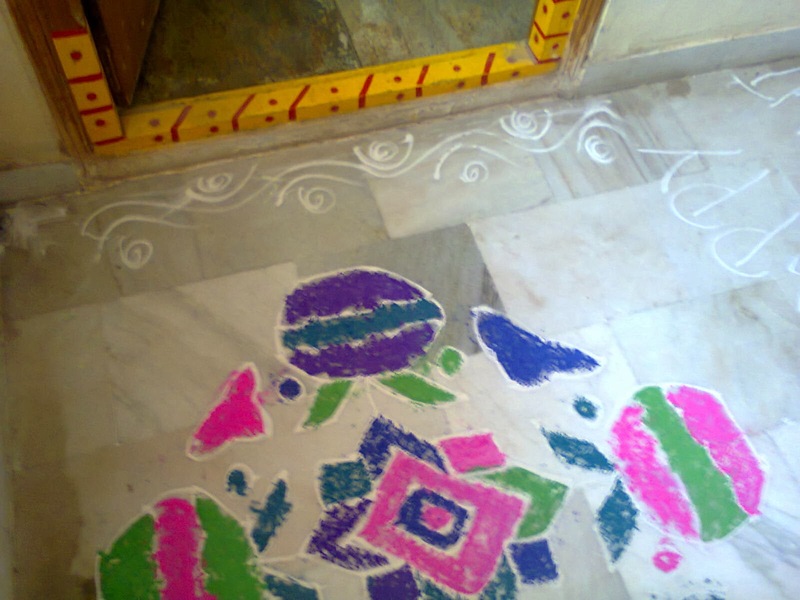 Rangolis (kolam or muggu) are drawn with colorful rice powder and lime mixed powders or chalk pieces or paints. Competitions also take place between neighbors in drawing the most beautiful attractive designs of rangoli. 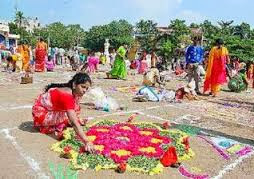 In the center and corners of Rangoli, they place big pumpkin flowers over cow dung balls and dance around the rangoli singing Sankranthi songs. Houses with children celebrate this day by showering a mixture of Bhogi pallu or gooseberries(local berries), flowers, coins, rice, etc. on children's head to protect them from evil eyes or sights. The whole scene looks very beautiful. These decorations of rangoli are done on all four days. The second day is celebrated as Sankranthi big festival also known as Thai Pongal or Pongal. The Pongal dish is prepared on this day and offered to God. The temples are thronged by devotees. This is actually regarded as a harvest festival. Harvesting is over by this time and all homes are full of new grains. The Pongal is prepared with these new rice. The daughters and sons-in-law come home and get treated with love and affection and receive gifts from parents and brothers. The third day is celebrated as Kanuma or Mattu Pongal. Mattu Pongal is a Tamil word. This day is for worshipping the cattle. Cattle are of major help in agriculture. So as a thanksgiving, they are especially worshipped on this day by bathing them and decorating with love and respect. It is considered on Kanuma day by some traditions, especially in Andhra, that eating something prepared of black gram dal is a must on this day. Generally, people prepare vada (or 'Garelu' in Telugu) and eat them after offering to God. It is also thought by some that one who does not bathe on this day and does not eat vada will take birth as a crow in his next birth. The last day is Mukkanuma. On this day people enjoy picnics or eating special dishes in homes along with relatives or friends. A sambar type preparation that is known as 'kolambu' in Tamil and 'pulusu' in Telugu languages is prepared which contains season's fresh vegetables and a bit of jaggery also besides toor dal and tamarind. Due to this dish, this day is known as Mukkanuma. Mukka means a piece of vegetable in the Telugu language. Some say mukka is a bit of Vada which is bitten on this day that has been prepared the previous day and so the name Mukkanuma. 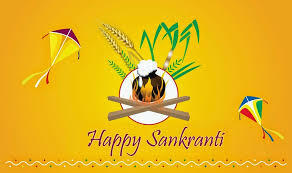 On the whole, Sankranthi is a festival of mainly four days for most Hindus celebrated to mark the completion of harvesting season and thereby thanksgiving to God and cattle. Sons-in-law have their prominence during this festivity. But, for the Vaishnava sampradaya people.this festival of Sankranthi is for one full month. They celebrate this occasion as Dhanurmasa. Dhanurmasa is the period starting from the day of Sun entering the constellation of Dhanur Rasi or Sagittarius and ending on the day when Sun enters the constellation of Makar Rashi or Capricorn. This is the period from 16th December to 14th January on most occasions. During this one month, they wake up early mornings and after bathing, prepare the Pongal which is the dish of rice and green gram dal. After cooking, it is flavored with Ghee, black pepper, jeera(cumin), cashew nuts, etc. by burning slightly in Ghee on a light flame and mixing in the Pongal. Puja is done to Vishnu Bhagwan by rendering Thiruppavai stanzas or 'pasurams'. Thiruppavai is the creation of Goda Devi also known as 'Andal', 'Nachiyar' or "Chudi Kodutha Nachiyar". She is one of the 12 Alwars or saints of Vaishnava sampradayam who lived at the start of Kaliyuga. She is the incarnation of Goddess Lakshmi coming to earth to preach people how to attain happiness and supreme bliss through true worship and devotion. She worshipped Lord Vishnu in the shape of Ranganathaswamy and Sri Krishna. She used to offer flower garlands to God after testing them by wearing and looking into the mirror to ascertain that they are good. She rendered 30 pasurams or stanzas by reciting one on each day for thirty days during this dhanurmasam. In the end, she pleased Lord and married Him. So, Vaishnava followers in Tamil Nadu and Andhra Pradesh, celebrate this Dhanurmasam very traditionally. Pongal is prepared by wearing sacred clothes(washed and dried separately without touching them) or silken clothes. The dish also is prepared without touching other things. Pooja is performed and this Pongal is offered to God with true love and devotion. Then it is taken as prasadam. There are some special days during this month on which days sweet Pongal is prepared (with rice, green gram dal, and jaggery) in place of hot Pongal including the last day of Sankranthi. In the sweet Pongal, kismis(raisin) and elaichi(cardamom) are added in place of black pepper and cumin as topper mixing. Many social events also take place on these days like kite flying, cockfights, bullock cart races, and bullfights or Jallikattu. People bet on these events and earn money even though such gamblings are prohibited at many places. Cultural programmes and music concerts are also held at temples and public places and people enjoy the season very much in a holiday mood.